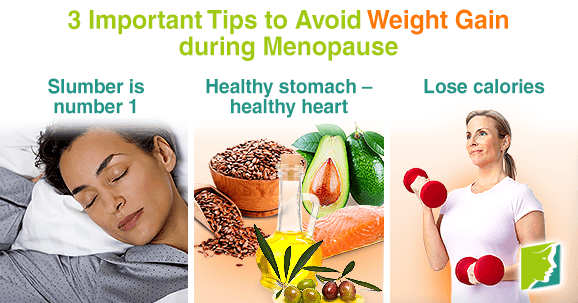 Weight gain during menopause is sadly inevitable. As the body ages, metabolism slows down, and declining hormone levels deteriorate muscle mass. Many women tend to gain between 10 - 15 pounds during menopause. If there were a pill that could prevent this from happening, it would likely be the most sought-after medication in the world. Since it doesn't exist, what can you do? Read on to find out the best ways to avoid weight gain during menopause. If you aren't getting a sufficient amount of sleep every night, this could be a major problem. Women who are sleep-deprived, especially during menopause, will suffer from weight fluctuation. This is due to the fact that appetite-regulating hormones are governed, in part, by sleep. If you don't get a full night of peaceful slumber, your hormone levels won't be able to let your body know when it has eaten or not. Thus, the body may feel hungry even after you have eaten. While soy products do not solve all menopause-related problems, they are a very healthy protein alternative. Track your steps with a pedometer - 10,000 steps a day is the goal! Keep in mind that you don't have to go big. Take small steps to incorporate fitness into your lifestyle and soon it will become something you crave rather than feeling like a chore. By taking your health into your own hands, you will reap the benefits of your labor. Focus on consuming a healthy diet, work up a sweat daily, drink plenty of water, and also get plenty of sleep at night. These tips will send you on your way to kicking those extra pounds out the door! Read about the best ways to combat weight gain.